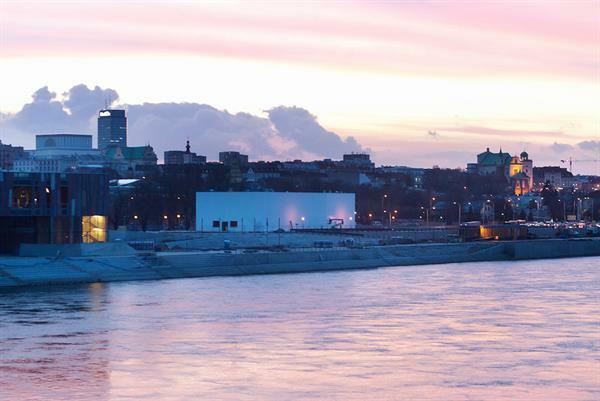 On Saturday, 25th of March, a new temporary contemporary art space will open along the Vistula River in Powiśle, one of Warsaw’s most historic neighborhoods. Situated near the Copernicus Science Centre and the Warsaw University Library, the Museum on the Vistula will host exhibitions and events, providing a meeting point for all until the Museum’s new building in Plac Defilad opens in 2020. Designed by renowned Austrian architect Adolf Krischanitz, the Pavilion has been made available to the Museum through a collaboration with the Vienna-based Thyssen-Bornemisza Art Contemporary (TBA21) foundation. Common exhibition projects are planned in the future. Conceived as a movable and reusable structure, the Museum on the Vistula features a 600 square-meter exhibition space, with an additional exterior area for the presentation of art, as well as an opportunity for artists to design the building’s façade. First installed in the center of Berlin at the former site of the Palace of the Republic, the Pavilion offered a provisional space for the Temporäre Kunsthalle, a temporary contemporary art installation that hosted events and exhibitions for two years between 2008 and 2010. The time restrictions for this interim exhibition space were reflected in Krischanitz’s beautifully clear and deliberate design, which emphasizes a range of possibilities for quick transformations, elasticity, and functionality. The main hall is conceived as a wooden construction with open-web girders, while the surrounding strip foundations form a stable basis for the wooden elements that emerge from them. The surfaces of the exterior skin and the inner walls are made from fiber-cement panels. The Museum of Modern Art in Warsaw will inaugurate the Pavilion in Powiśle with an exhibition that explores the cultural connotations and universality of Warsaw’s iconic symbol within the context of creating a modern urban identity. The Beguiling Siren Is Thy Crest features the works of national and internationally renowned artists, including Korakrit Arunanondchai, Evelyne Axell, Alex Baczyński-Jenkins, Louise Bourgeois, Bernard Buffet, Claude Cahun, Liz Craft, Edith Dekyndt, Christian Dietrich, Leo Dohmen, Drexcyia with Abdul Qadim Haqq, Elmgreen & Dragset, Leonor Fini, Ellen Gallagher, Dorota Jurczak, Birgit Jürgenssen, Tobias Kaspar, Gina Litherland, Sylvia Palacios Whitman, Pablo Picasso, Agnieszka Polska, Carol Rama, Erna Rosenstein, Tejal Shah, Penny Slinger, Juliana Snapper, Franz von Stuck, Alina Szapocznikow, Dorothea Tanning, Wolfgang Tillmans, Tunga, Anne Uddenberg, Hannah Wilke, Ming Wong, Marcelo Zammenhoff, Anna Zaradny and Artur Żmijewski. Founded in 2002 by Francesca Thyssen-Bornemisza in Vienna, Thyssen-Bornemisza Art Contemporary (TBA21) represents the fourth generation of the Thyssen family’s commitment to the arts. As a foundation of contemporary art and dedicated to the worldview changing realization that can be called the Anthropocene, TBA21 is foremost a space within which very different kinds of knowledge and practices can meet. TBA21 collection is the result of the foundation’s ongoing commitment to commissioning and developing art projects that defy traditional categorization, including large scale installations, sound compositions, performance, and contemporary architecture. It promotes practices that are informed by social and environmental concerns, transdisciplinary forms of knowledge that forge new, productive relations between artistic research and the creative work of the sciences and humanities, and investigations of the pressing issues of contemporary life. After more than 16 years of collecting, commissioning projects, and engaged exhibition practice, TBA21 has established a highly respected collection of more than 700 contemporary artworks by nearly 200 artists from around the globe. Traversing different geographies and contexts from Central and Eastern Europe, Southeast Asia and the Indian Subcontinent, Oceania to Latin America, TBA21 foregrounds artists practices that change the terms of engagement between art and the societies it inhabits. TBA21–Academy is the exploratory soul of Thyssen-Bornemisza Art Contemporary and an itinerant site of cultural production and transdisciplinary research. Conceived in 2011 as a moving platform on the oceans, it brings together artists, researchers, and thinkers from various fields concerned with today’s most urgent ecological, social, and economic issues. Through its expeditions on sea and land, the Academy seeks to reinvent the culture of exploration in the 21st century, while inciting knowledge creation, new modes of collaboration, and the coproduction of solutions for the pressing environmental challenges of today.